WOW!! 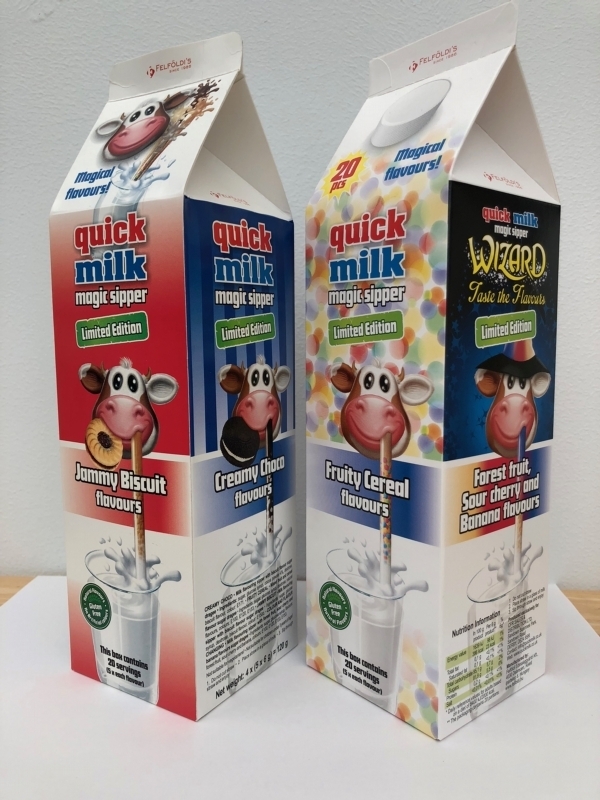 Look at this Quick Milk lovers.... NEW & UNIQUE....... 4 new flavours: - Jammy Biscuit, Creamy Choco, Fruity Cereal Wizard (colour & taste changing) Beautifully packaged in a "Milk" carton. 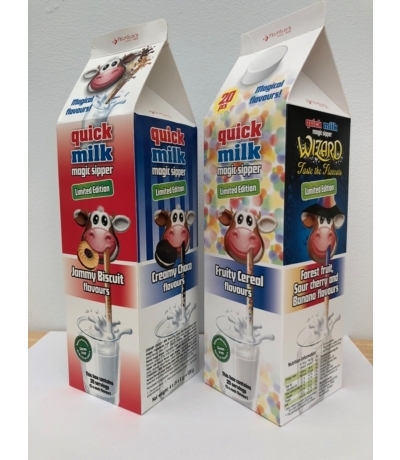 Each Quick Milk Magic Sipper "Milk" carton, contains 20 milk sippers - 5 of each flavour This will be dispatched flat packed for ease of postage & delivery - it is letterbox friendly!! Give it a try - you'll LOVE them! Beautifully packaged in a "Milk" carton. This will be dispatched flat packed for ease of postage & delivery - it is letterbox friendly!! Give it a try - you'll LOVE them! Quick Milk - all variants - Nutritional Info: The Chocolate, Banana, Vanilla, Caramel, Chocolate & Banana, Biscuit, Vanilla Ice Coffee, Caramel Ice Coffee and Classic Ice Coffee Coconut & Chocolate, Tropical with Multivitamins, Tropical with Probiotics, Organic Chocolate, Organic Strawberry & Organic Vanilla Quick Milk Magic Sippers ARE suitable for vegetarians & Vegans! All variants are not suitable for a Kosher diet. All variants are suitable for a Halal diet. Quick Milk Magic Sippers are Dairy, Egg, Sesame & Gluten free.